My bike was actually my husbands bike! I stole it from him because I loved it so much! My husband decided in 2011 he wanted to start riding. He also mentioned that I should join him. Not being sure, I agreed as long as I could have my own bike. We are business owners who work together all day long as well as parents to 3 beautiful girls and thought that maybe it was time to take some time for ourselves. From the beginning we decided that this would be done together. We even took the courses together. 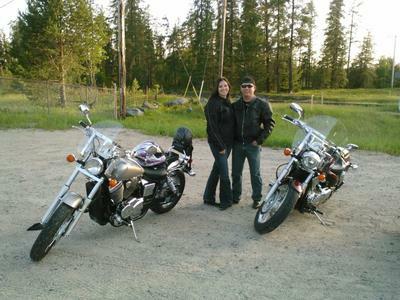 Ian then got himself the 2002 Honda Shadow 750 and was really happy with his new toy and loved it very much. Being that I did not have a bike yet I would just ride his bike for practice until we found one I liked. We looked around for bikes that I might want but it didn't take long for me to realize that I did not want to get a new bike I liked his very much and decided he could just find his own bike. He then proceded to looking for yet another bike he could love and came accros his 2006 Honda VTX 1300 that he can now call his own. In August of 2012 I did my first ever big ride on the highway to Sudbury Ontario. I have come to realize that I now understand why it is Ian enjoys riding so much. I am glad we have decided to attend this challenge together...something that we can do together for a while to come! Riding the highway with my best friend! Join in and write your own page! It's easy to do. How? Simply click here to return to Ontario Motorcycle Rides Bike of the Month!.